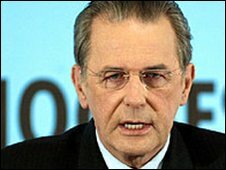 International Olympic Committee chief Jacques Rogge says preparations to host the London Olympics will stay on track even if the government changes. Speaking at the SportAccord International Convention in Dubai, Mr Rogge said he was comfortable with the possibility of a shake-up. He said: "We discussed the possibility of a change of government. "We're at ease about that as the Olympics has a strong multi-party support." "We are pleased by the pace of construction, preparation and marketing." Paul Deighton, CEO of the organising committee for the London Games, added: "We are on time and on budget. "Anyone who has concerns about preparations should come along and take a look at the Olympic Park and they will be left in no doubt that we will be ready. "We will have brilliant venues; existing ones as well as new." Via a video message to delegates, London Mayor Boris Johnson joked that the city should stage the Games a year earlier than planned to "get a head start on the rest of the sporting world". London will host the 2011 edition of the SportAccord International Convention. The event will bring together more than 1,500 stakeholders from the sports industry and Olympic movement.